Citation Information: JCI Insight. 2019;4(7):e124620. https://doi.org/10.1172/jci.insight.124620. BACKGROUND. HDL that contains apolipoprotein E (apoE) is a subspecies especially active in steps in reverse cholesterol transport, a process that brings cholesterol from peripheral cells to the liver. Here, we studied the effect of dietary unsaturated fat compared with carbohydrate on the metabolism of HDL containing apoE. METHODS. We enrolled 9 adults who were overweight or obese and had below-average HDL-cholesterol in a crossover study of a high-fat diet, primarily unsaturated, and a low-fat, high-carbohydrate diet. A metabolic tracer study was performed after each diet period. RESULTS. Dietary fat increased the secretion, metabolism, and clearance of HDL subspecies containing apoE. Dietary fat increased the rate of clearance of large cholesterol-rich HDL containing apoE and increased their conversion to small HDL containing apoE, indicating selective cholesterol ester delivery to the liver. The high-unsaturated-fat diet did not affect the metabolism of HDL lacking apoE. CONCLUSION. HDL containing apoE is a diet-responsive metabolic pathway that renders HDL more biologically active in reverse cholesterol transport. This may be a mechanism by which unsaturated fat protects against coronary heart disease. Protein-based HDL subspecies such as HDL containing apoE may be used to identify additional atheroprotective treatment targets not evident in the total HDL-cholesterol measurement. TRIAL REGISTRATION. ClinicalTrials.gov NCT01399632. FUNDING. NIH and the National Center for Advancing Translational Science. Overview of dietary intervention and sampling protocol. 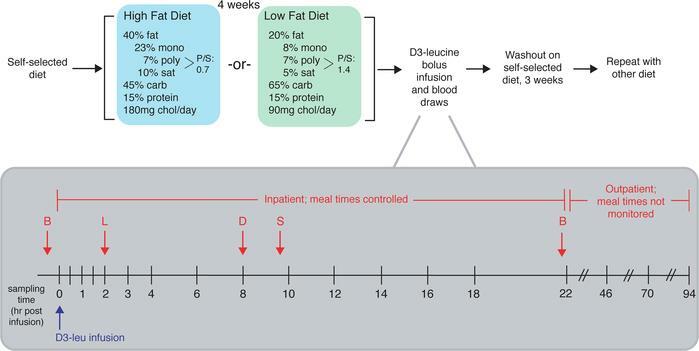 After screening, study participants were instructed to continue on their usual diet (self-selected diet) prior to the study period, upon which they were randomized to either receive a high-unsaturated-fat or low-fat diet for 4 weeks. After 4 weeks on either diet, subjects were admitted to the hospital on the morning of day 29 for the infusion protocol. They were instructed to eat the prescribed study breakfast (B) before coming to the hospital. At 10 am (time 0), each subject received a bolus infusion of D3-leucine. Samples were collected at 0, 0.5, 1, 1.5, 2, 3, 4, 6, 8, 10, 12, 14, 16, 18, and 22 hours after infusion while the study participants were in the hospital. Participants also ate lunch (L), dinner (D), and a snack (S) in the hospital. After the 22-hour sample was collected, participants were released from the hospital with their remaining study meals and were instructed to return to the hospital at 10 am for the next 3 days for the remaining blood draws (46, 70, and 94 hours). Before receiving the alternate diet and repeating the study protocol, they were instructed to return to their usual diet for a washout period of 3 weeks. Mono, monounsaturated fat; poly, polyunsaturated fat; sat, saturated fat; carb, carbohydrate; chol, cholesterol.